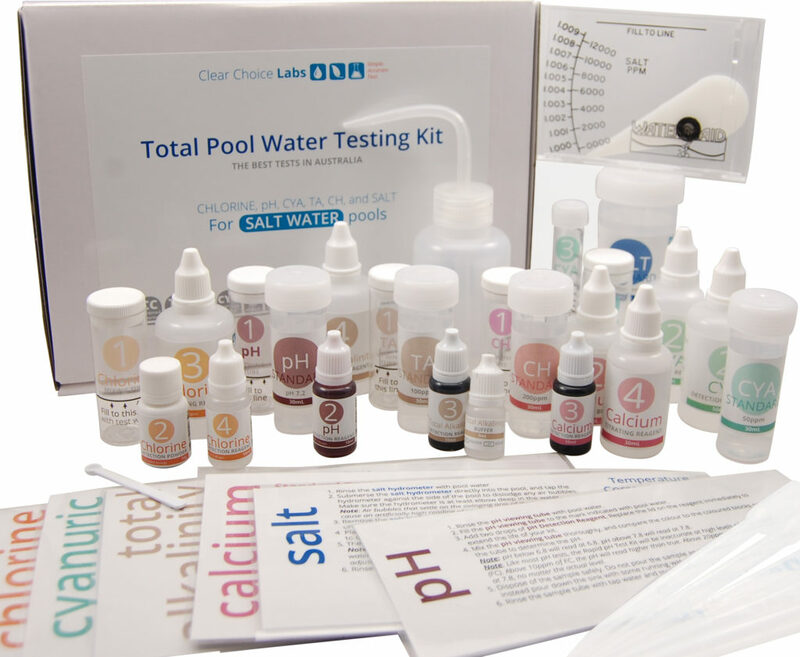 Some people have asked us whether our reagents are compatible with other commonly available Australian FAS-DPD pool test kits. Where we know this information, we have provided it below. “Full” means that these chemicals are essentially identical. “Compatible” means that as long as the reagents are used in our bottles, then our reagents are 100% compatible, even though our drop sizes may be different. We’d be happy to answer any questions, just drop us an email at support@clearchoicelabs.com.au. pH Detection Reagent R-0014 Not Compatible (1) C-0101 ? pH Detection Reagent R-0004 Full (1) C-0101 ? Total Alkalinity Buffer R-0007 Full C-0301 ? Total Alkalinity Detection Reagent R-0008 Full (2) C-0302 ? Total Alkalinity Titrating Reagent R-0009 Full C-0303 ? Calcium Hardness Buffer R-0010 Full C-0401 ? Calcium Detection Reagent R-0011L Full (2) C-0402 ? Calcium Titrating Reagent R-0012 Full C-0403 ? Salt Detection Reagent R-0630 Compatible ? ? Salt Titrating Reagent R-0718 Compatible ? ? The pH solutions R-0004 and R-0014 are the same chemical, but at different concentrations to suit different comparators. Depending on which comparator you are using, either reagent may work for you if you adjust the number of drops. Note that the drop size in our bottles are about 3/4 of the size of the Taylor reagents, but our chemical concentration is the same. Therefore, the number of drops to use in the Taylor tests should be increased compared to their instructions. We have tested our Chlorine Detection Reagent against the NQ-100, and can confirm that we can use this reagent to add combined chloramine detection to this kit. This entry was posted in Help! and tagged calcium, chlorine, CYA, pH, reagent compatibility, total alkalinity. Hi, on your FAQ under the question titled “Do your reagents use Taylor Technologies chemistry” you state that the R-871 is a different concentration so the two couldn’t be mixed, but on this page you say it is “Full”. Maybe I am misunderstanding, but I think the FAQ suggests is it “Compatible: i.e. in your bottle? Unfortunately I bought a Taylor K-2006 kit before I found out about you guys but as I run out of reagents I will replace with your ones and the first one I have run out of is the R-871 FAS so just wanted to check it is correct. Could I put your reagent into the Taylor bottle? Thanks! Thanks for writing! You’ve spotted an oopsie where we haven’t kept everything up to date. The FAQ was written back in 2015 where we could not reliably source bottles with a consistent drop size, and we needed to make adjustments to the reagent to give customers results that they were expecting. However I am pleased to say that we resolved this issue, and you can now put this reagent in the Taylor bottles should you wish! I will update the FAQ right now!